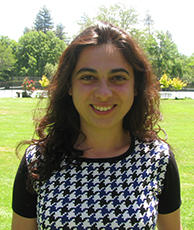 Andreea Minca is an assistant professor in the School of Operations Research and Information Engineering at Cornell University. She came to IPAM for the first time to participate in the long program Broad Perspectives and New Directions in Financial Mathematics. I work in mathematical finance, which is an interdisciplinary field that is between mathematics and economics. The part in mathematics is in the probability subfield and the part in economics is in the finance subfield. How does that fit as part of your department? In operations research we are concerned with using sophisticated mathematical tools like stochastic analysis to aid in decision making. Mathematical finance or financial engineering is a part of this. You have a very interesting background, having started university studying computer science in Romania and then transferring to the Ecole Polytechnique in Paris. How did you get attracted to math finance? I was recruited by professors from Romania who worked at the Ecole Polytechnique. But it turned out that at the Polytechnique they didn’t focus on computer science so much; it wasn’t the top priority. But then I met Nicole El Karoui, who is the matriarch of mathematical finance in France if not in Europe. She was one of the first to ride the wave of developments in probability and apply them to finance. And she created one of the first master’s in mathematical finance, jointly between the Polytechnique and the Laboratoire de Probabilitiés et Modèles Aléatoires at Paris VI; it was very heavy on probability and stochastic processes, because the problem of hedging is related to the problem of martingale representation. So I joined this program and that’s how I got into the subject. Later, when I was graduating with my PhD, I was both thinking of industry positions in banks and of academic positions, so I applied to both. It was after the financial crisis, and the field of mathematical finance was redefining itself, looking at new problems and to understand better the assumptions underlying the old problems. I decided to postpone going to industry so that I could think about these new problems more, and so far I am still thinking about them. You came to both the workshop on systemic risk as well as the workshop on financialization of commodities. The first one is an obvious one for you. Why did you pick the commodities workshop, as opposed to one of the others? That is an interesting question. I think systemic risk is important, but it is not only an issue for financial systems. It is an issue for any large system. And we are going to face systemic risk also in the electrical grid, blackouts can propagate from one place to another. Even though it is a different sort of network — the electrical grid obeys Kirchhoff’s Laws for example — it is still a network and to maintain its capacity there is a cost. To what extent can we minimize that cost? There is also another problem, that was discussed during the workshop, that renewable energy sources are being integrated into the grid. You have wind and solar energy, which are random, so you have stochastic sources of energy that need to be modeled. How are you going to also invest and maintain capacity in view of these random factors? How do you maintain systemic stability? There are a lot of interesting problems there that mathematics could help with. And of course that has a lot to do with finance because the provider has to price the electricity. This spring was the first time you came to IPAM. Has your visit helped you in your research, by inspiring new projects, or making new connections? First of all, the IPAM programs are great for seeing what the exciting problems are in a field. They are not just for researchers who already have an agenda, but also for PhD students who are wondering what they should do in the future. I told my PhD student that he had to come to IPAM, because it was the perfect way for him to see and understand everything that is going on. Second, my student and I were working on a project on mean field interactions on a network, not necessarily related to finance. While at IPAM he found out about your upcoming summer school on games and contracts for cyberphysical security, so he will attend that. Third, at IPAM I connected with some government regulators like Michael Gordy who expressed interest in my research. They said that they have some ideas for extensions of my work, which is great. That is, while of course we find mathematics interesting, it is important that it eventually gets to people who can use it for something. That is what is really great about IPAM: there is a selection bias, in that the decision-makers who arrive at IPAM are the ones that are pre-disposed to listen to mathematicians. They are convinced already of the importance of sophisticated mathematical models and they want to talk about them with mathematicians. Fourth, the Inaugural Meeting of Women in Financial Mathematics was a great event for my PhD student, who wants to go into industry. We got a lot of good mentoring about how to present our work to industry and what industry views as the important topics. Great advice on not just how to get a job, but also how to ask for mentoring once you are there. And one of the panelists talked about a subject related to a paper I am currently writing, so I just sent her a copy. If you are just sitting in a math department, who would have guessed you would find such high-powered executives of big financial firms, and all women, connecting with mathematicians? It was a great experience. The long program you attended aimed to ask new questions in mathematical finance. Was there a scientific topic that you think would have fit well in the long program, but wasn’t there? I think that problems related to the “buy side” will become more important as we try to exploit big data more and more. For example, I studied the problem of several investors that hold similar portfolios to mine. If some of those investors are in distress, then that will affect my holdings even if I am a buy-and-hold investor. Understanding this risk is a problem for the buy side. It does not necessarily need sophisticated mathematics, but it requires us to work with data to understand which factors are relevant and which are not relevant. And there is still a lot of room for mathematics, because in this problem, all the investors are connected in a network. So in any collection of investors, one can ask for the clusters — which collections of portfolios are closely related? It is the one that I presented at IPAM, titled When do creditors with heterogeneous beliefs agree to run? It is about trying to understand how creditors of a financial institution are going to base their decisions on giving credit. What was different about our study, and I really like this idea, is that we allowed them to have different beliefs about what the performance of the investment will be. I like that paper a lot because it combines game theory with stochastic analysis. It gives some interesting insight; it’s a theoretical paper, but you get out of the model that there are some important quantities that you should look at in reality. I like it also because we solved this problem from scratch, but then later we discovered that it is connected with other problems, such as the global games framework. You can read more about Dr. Minca’s work on her website.